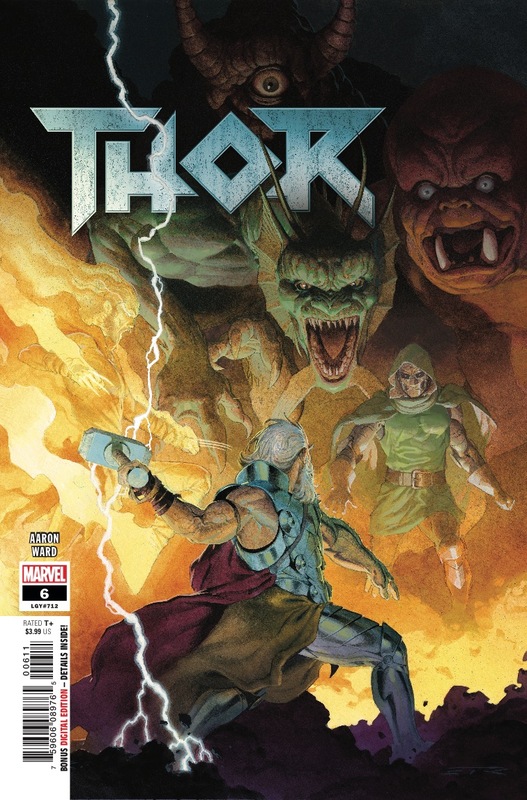 Thor #6 Review – AiPT! The funny thing about fight comics is they tend to hold less weight once it’s all done with. Generally, we know who will win and the stakes aren’t much higher than a few bruises or maybe even death (which is increasingly unimportant in comics). This issue of Thor, however, does the fight comic with an added twist that should keep readers very interested. This story takes place far in the future after everyone on Earth was killed and most life in the universe is long dead. Dr. Doom is still alive however, and it might just take a Phoenix Logan and an All Father Thor to stop him. If Christian Ward is drawing a comic I have to start with his art in any review. The art is so damn mesmerizing it makes it hard to not linger on every panel. It’s suited to the cosmic side of Marvel in part because of the colors, but also the incredible effects. Layered on top of the art is interesting effects that draw you in, like blur or layered elements like the flames. Dr. Doom is a force and you get that from the visuals, but so is Logan who you’ve never seen quite like this. As they battle here there are opportune close-ups and great uses of space to keep the imagery alive and always pushing forward. It’s dazzling stuff. The story at its core is all about fighting, although the opening and closing are exceptional in a different way. The fighting is fun and it goes back and forth, like a good volley keeping your interest. No, instead it’s the ending that will have you on the edge of your seat. I’ve said time and time again I love Aaron’s ability to cast a mythical sort of story that feels momentous and important, and that describes this ending. I won’t ruin it, but it goes a route that suggests he may be done telling this end of days story only to leave us with a cliffhanger, making u guess even more. The opening is rather interesting, involving some humans interacting with Dr. Doom. Doom Quickly learns these folks see Thor as a god — more specifically THE God — and that puts this whole hero business into an interesting light. Since the story takes place at the end of time, it’s hard to care much for what might happen. This story has been dabbled in over the last few months but never truly focused on, making it feel a bit tacked on. The ending makes up for it and adds a lot more meaning to things, but as it stands it’s hard to care about all this fighting. A good issue with an excellent ending. Come for the light show by Christian Ward who positively dazzles with his art, but stay for the ending that melds superheroes and myth in one fell swoop. Come for the light show by Christian Ward who positively dazzles with his art, but stay for the ending that melds superheroes and myth in one fell swoop. Hard to care that much about this battle at the "end of time"